This initially seems to be a big step back. Using Google's Transit directions in iOS 5 Maps, you could find your way around within and between lots of cities. 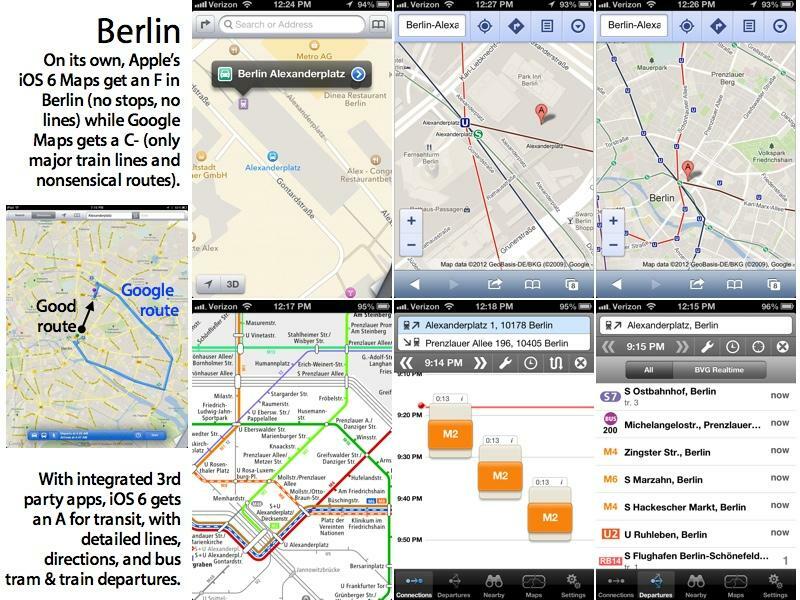 Google's depicted transit information in iOS 5 Maps was relatively basic however; a global "one size fits all" approach that often provided incorrect, confusing or misleading information. Just looking at the map, iOS 5 Maps shows most surface railways and indicates different types of metro stations (something iOS 6 Maps falls short in doing, as detailed below). Few cities show any actual transit routes on the map though. Ask for directions, and Google's results range from helpful to ludicrous, depending on the city you're in. For example, in the San Francisco area, Google's maps show different station icons for regional Bart subway stations; for Amtrak and Caltrain regional rail stations; for SF Muni street cars and VTA light rail stops; a fourth icon for ferry boat landings and a separate one for bus stops. Ferries routes and some train paths are indicated on the map, but there are no bus routes (nor are most bus stops indicated) and the path of most subways can only be guessed by connecting the stops. Ask for directions around San Francisco, and Google will provide a few options that take you from bus to Bart to Muni metro to Caltrain and even ferries across the bay. Unfortunately, it provides arrival times that have no correlation with when Muni busses or trains will actually arrive, even though the local transit agency has GPS transponders on all its vehicles that publish exact arrival times. Many third party apps show this information, but Google has chosen not to for some reason. Google's calculated routes (in iOS 5 or via its Google maps Android or web app) also often make no sense or are absurdly out of the way. While standing at a Muni Metro station (and providing my current location), Google provided four options that all directed me to walk a quarter mile to catch a bus (or alternatively a similarly out of the way Bart train, neither of which would take me more directly to my destination), rather than just taking one of several metro trains that would get me there in half the time. From San Francisco's Dolores Park, which is directly served by a streetcar line that dives underground to take riders downtown, Google provided four options for getting to "Powell Street," but each one randomly determined that rather than getting me to Powell Station at Powell and Market, I should transfer to the 9 mph touristy cable car to double my transit time, estimating more than a half hour for what should take around 15 minutes. The arrival times it reported were wrong; had I made plans around them, I would have missed the train. Google also suggested several other half hour trips that made even less sense. It is typical, not occasional, to get bad route estimates, bad arrival times, and irrelevant route suggestions. In some cases, Google can recommend useful routes, but the departure times it provides usually wouldn't help you actually catch any of them. If you want useful transit directions in San Francisco, you wouldn't use iOS 5 Maps. 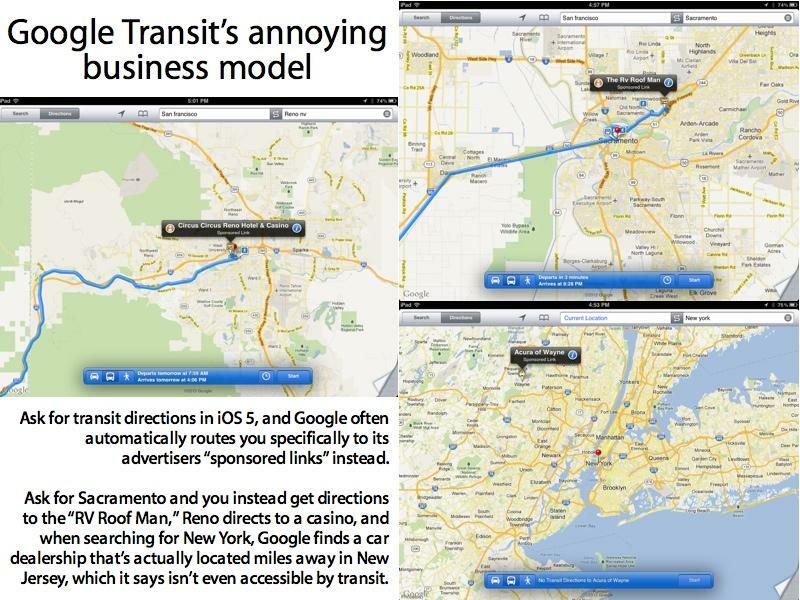 In iOS 6, Apple doesn't fix the problems with Google Transit in San Francisco on its own. Instead, it delegated the task to third parties who do. 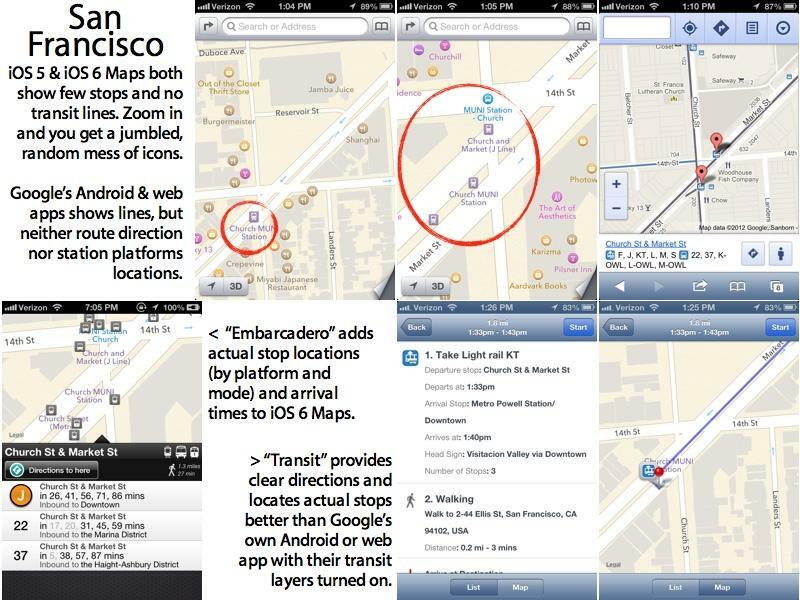 The base map in iOS 6 is actually less useful in navigating transit than iOS 5 was, but install helper App Store titles (like Embarcadero or Transit, shown below) and iOS 6 shoots way past the iOS 5 experience and delivers better presented, more complete and more accurate information for transit users. Ask for transit directions from San Francisco to Reno, Nevada, and Google only offers a variety of ways to take two or three transit systems toward an Amtrak train that leaves from the other side of the bay, which just by itself would cost three times as much and take just as long as riding a Greyhound bus directly from downtown San Francisco. If you want non-driving routes between most U.S. cities, it usually makes no sense to try using Google Transit. In Portland, Oregon, (where Google Transit originated) iOS 5 Maps show Max light rail stops and some bus stops, but no lines. Ask for directions between virtually any two points and you get sensible routes for either the Max or bus, along with arrival times that are typically correct because the transit system there is run on an actual schedule. Google Transit seems to work well in Portland. In Berlin, iOS 5 Maps similarly indicates U-bahn subways and S-bahn urban trains with separate icons, but doesn't show routes between stations (apart from where these are obvious from the surface train line paths). It also doesn't show routes or stops for regional Deutsche Bahn trains, MetroTram light rail, or any of the 150 bus lines in the city. Ask Google for directions around Berlin in iOS 5 Maps, and you can get extremely basic routes and times between only the major metro stops. For example, if you ask for directions between Alexanderplatz and Prinzlauerberg, Google provides two ridiculous route options (with two or three connections, above) that would take as long as walking. Consult Berlin's transit website (or one of several iOS apps, like Berlin Fahrinfo, shown below) and you'll find there's an M2 streetcar tram that takes you directly between those points in half the time. If you want functional transit directions in Berlin, you wouldn't use Google. In Paris, Google can't find any routes, not even via the metro. It also isn't any help getting around France, whether you want to go to Versailles or Nîmes. Ask for directions to Berlin, and Google will recommend an ICE train (note that Google just added routing support for Germany's Deutsche Bahn trains last month), but it recommends walking 2km across Paris to catch it, rather than offering any information for subways to get you there. There are several iOS apps and websites that provide the directions around Paris and France that Google can't provide, and some already provide iOS 6 integration. 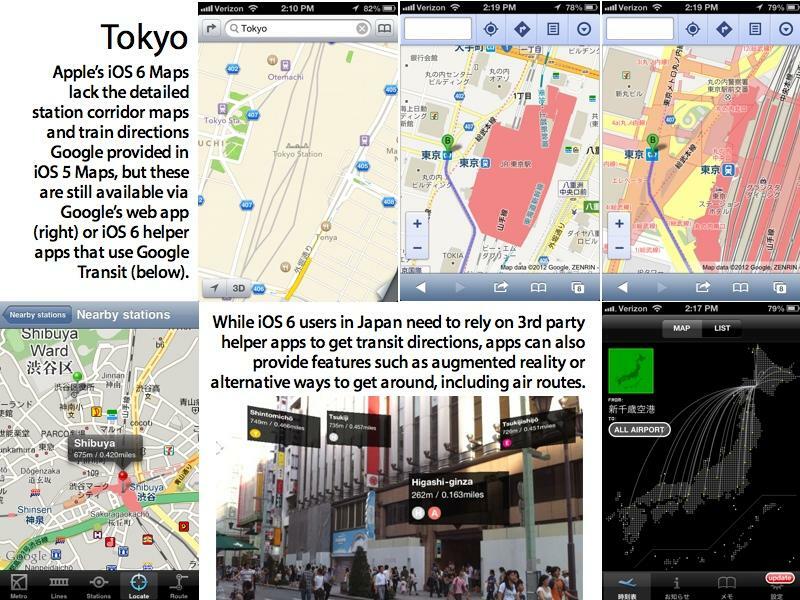 In Tokyo, iOS 5 Maps indicates at least four different transit systems with unique icons (Tokyo Metro, Toei subway, JR regional trains or monorail and interurban Shinkansen bullet trains), and it prominently shows both surface and underground metro paths throughout the city (and in other major cities, such as Sapporo), with detailed station maps, their underground passages, and named exits (visible in light pink below). There are no city bus routes or stops. If you want to navigate by train within Tokyo or across Japan, you can do it pretty effectively with Google Transit. There's no Google Transit information on trains in Thailand outside of Bangkok, and if you want transit directions around Melbourne, Australia, or to Bondi Beach, or between most cities in Australia, no luck. Google doesn't provide any outside of New South Wales, which it just added this summer. Google does list some sort of transit support in over 500 cities, but that includes lots of cities where it doesn't really work or isn't really very effective or accurate. Google is in the transit information business to make money, and this is reflected in the often annoying routes it often assumes for you when you ask for transit directions. It couldn't put ads on the screen in Apple's iOS 5 Maps, so it instead just gave you directions to its sponsored links, no matter how ridiculous these might be, and no matter how this might negatively impact the usefulness of the route information you get.